In the time that I have been working as a broadcast engineer, I have seen some pretty unique transmitter sites. The aforementioned power plant, with the antenna mounted on a smoke stack. 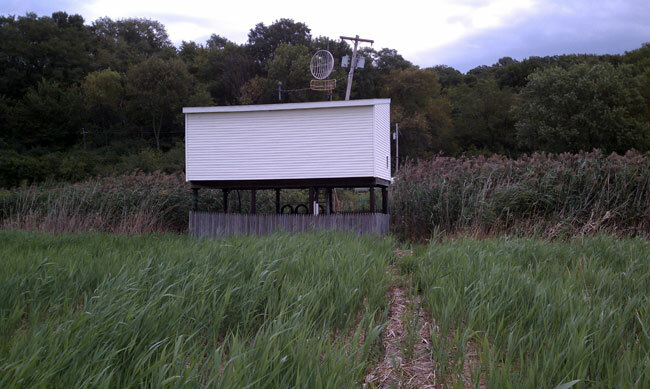 The more traditional AM station, located in a swamp. Other stations both AM and FM combined into one antenna, etc. This is WGDJ, 1300 KHz, Albany, NY. It is located in what might be a swamp, if we were not experiencing marginal drought conditions this summer. 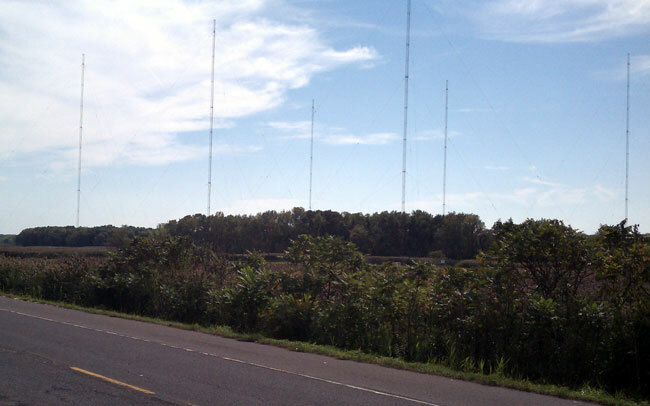 The transmitter is located along route 9J. 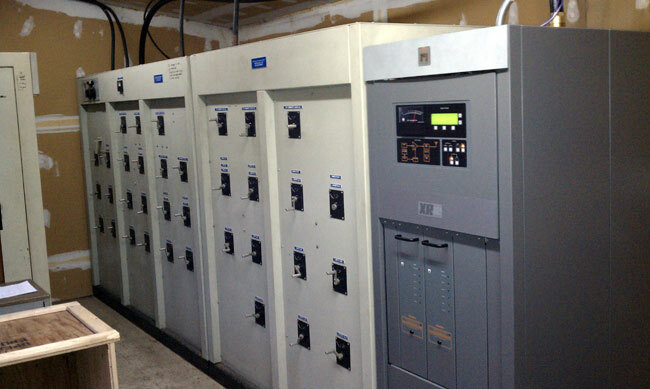 It is a four tower directional daytime, 10 KW and a six tower directional night time, 5 KW. Nothing spectacular, 90 degree towers, spaced 90 degrees apart. Since they are below 200 feet, they don’t need to be lit or painted, which is nice. The building and all the towers are on 20 foot high steel stilts. The area is right next to the Hudson River and often floods in the spring time. The transmitter site sort of reminds me of something I once saw at coastal radio stations WCC and KPH. They were located along salt water bays. The station signed on the air in 1963. Initially, it was a 5 KW daytimer only. They added night operation sometime in the seventies. Around 2006 or so, they went to 10 KW day, 5 KW night. The phasor is gigantic for a 5 KW station, or even a 10 KW station. I’ve seen smaller phasors on 50 KW directionals. It has a “Quakertown, PA” name plate on it, which may be the forerunner of Phasetek. There is a rare art form to creating a functional, yet space economical phasor. Harris could sometimes pull it off, RCA did well, Kintronics seems to be the one of the top phasor makers today. 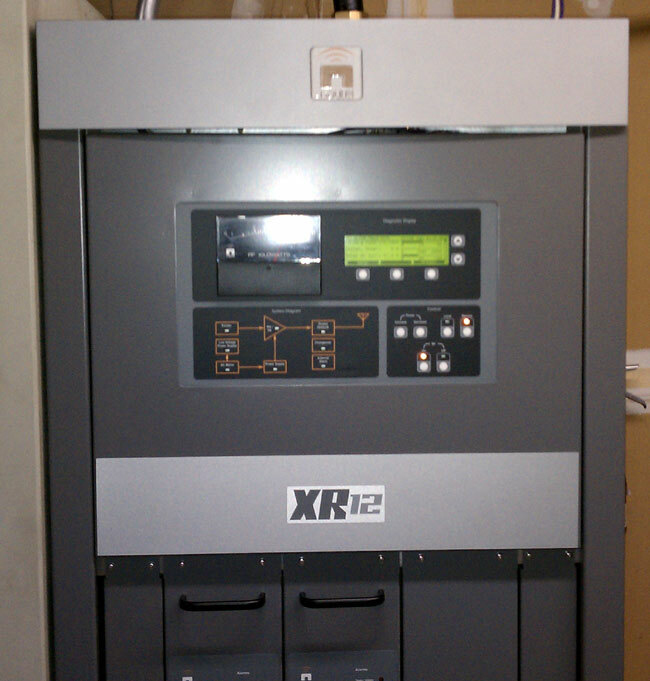 The main transmitter is a Nautel XR12, which as a very similar look as the V series FM transmitters. The backup transmitter is a MW5A, which, quite frankly scares me. 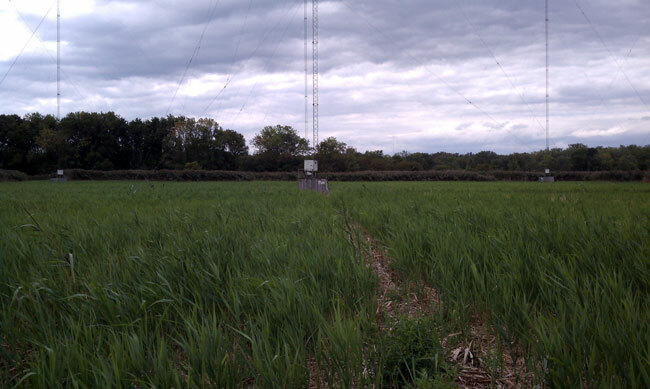 The site was just recently air conditioned, which means the MW5A transmitter was sucking swamp air through it for 25 years. I do not want to turn that thing on under any circumstances. All in all, the station has a pretty good signal into the capital city of New York. It nulls to the west, somewhat. Being on 1300, it doesn’t carry as far as some of the other class B AM station like WROW 590 Khz, but it does alright. After years of neglect, the station is making a bit of a come back in the Albany market. They do a lot of local talk radio, which, when the other station is carrying almost all satellite syndicated talk, is making an impression. Being the state capital, there is a lot of fodder.